Johns Hopkins Hospital is so expansive it's part of the Baltimore skyline. In U.S. News and World Report’s ranking of Best Hospitals, Maryland does very well. Out of about 70 hospitals in the state, USN found that 16 met the standards to be ranked. USN ranked hospitals looked at 16 speciality areas of practice that determine the best hospital rankings mostly on data from the hospitals, but also on physician surveys. Good hospitals and medical care are increasingly important as we age, when traveling to and from treatment becomes more cumbersome. In Maryland, 11 of the top 16 hospitals are in Baltimore City or Baltimore County. Part of this is due to the fact that the Johns Hopkins University and University of Maryland hospital systems have large, flagship teaching hospitals in the city. Their overall health systems are growing, and acquiring existing hospitals and patient practices. However, Maryland residents can also find quality hospitals in Annapolis and on the Eastern Shore. Here are some of the top hospitals and active adult communities close-by. 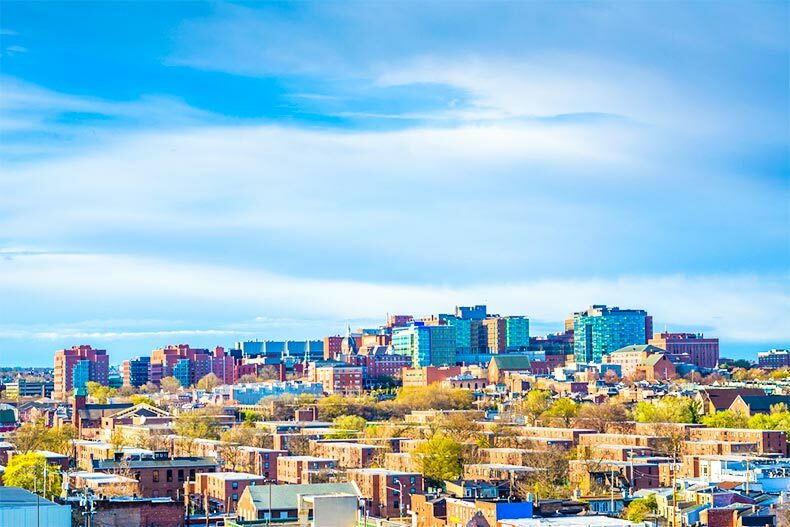 Many people know of the Johns Hopkins Hospital as one of the top hospitals in the country, so it’s no surprise this long-standing medical institution made the top ranking in Maryland. As the No. 3 hospital in the country, Hopkins received the No. 1 spot nationally for rheumatology and the No. 2 spot for specialities including urology, neurology, and geriatrics. Maryland’s No. 2 hospital is the University of Maryland Medical Center. While not ranked as high nationally as Hopkins, University of Maryland does rank for specialities like cancer and urology. Johns Hopkins and University of Maryland are both teaching hospitals, which means that medical students, residents, and fellows at the medical schools of the university receive training and do teaching at the hospitals. The greater Baltimore metro area is home to 45 active adult communities. While distance-wise it may not be the closest to these two hospitals, The Gatherings at Quarry Place might be the most convenient. Located in Reisterstown outside of Baltimore, this active adult condo community is walking distance from the metro, which stops both at University of Maryland and Hopkins hospitals. In Ellicott City, active adults can find homes in communities that have easy access to the city via Interstate 70, including The Enclave at Ellicott Hills and Ellicott Meadows. The Enclave at Ellicott Hills offers attached homes and condos from two to four bedrooms for resale. Ellicott Meadows offers single family and attached homes for resale. Both communities offer suburban, resort-style living centered around a community clubhouse. Although many Annapolis residents are just half an hour from these high-ranking Baltimore hospitals, the Anne Arundel Medical Center ranks as No. 6 in Maryland. USN determined that the hospital ranked well in knee and hip replacement and heart failure treatment, among other conditions and specialties. Heritage Harbor is one of the most popular communities in Maryland, and the second largest in the state. Located in Annapolis, with easy access to the highway and bus system, this 55+ community offers condos, attached, and single-family homes in a variety of sizes and styles. Residents enjoy the many community spaces, and can easily stay active at the pools, fitness center, golf course, tennis courts, walking trails, and even on the water. Quality care on Maryland’s Eastern Shore should be important to residents, especially those over 55. Since it can take anywhere from an hour to three hours to get back to the Baltimore-D.C. metro area, residents need to have trusted healthcare options nearby. Fortunately, two of the Eastern Shore’s hospitals made it on USN’s list for Maryland. The Peninsula Regional Medical Center in Salisbury and the University of Maryland Shore Medical Center at Easton tied with four other hospitals for the No. 10 spot. The Peninsula Regional Medical Center is a general and surgical hospital that ranked well in colon cancer surgery, hip replacement, and heart failure. USN also noted that it scored high in patient safety and reducing mistakes. The University of Maryland Shore Medical Center at Easton is part of the University of Maryland health system and a general medical and surgical facility. USN determined it was high performing in hip replacement, Chronic Obstructive Pulmonary Disease management, and heart failure treatment. Easton and Salisbury are about an hour apart, with Salisbury being the closest hospital for residents of the Ocean City area. In Salisbury, SummersGate offers residents over 55 a peaceful shore lifestyle. The 212-home community centers around a clubhouse and green that offer meeting spaces, an outdoor pool, barbecue area, and green space. In Easton, the larger community of Chesapeake include 452 homes offered for resale only. The spacious single-family homes are two and three bedrooms, and generally sell in the $300s. Residents also have access to the large clubhouse, meeting rooms, fitness center, outdoor pool, tennis courts, and putting green.